For centuries, Portuguese nuns doubled as egg yolk–slinging pastry chefs, cementing the country’s specialty in yellow-hued sweets. There’s ovos moles, small, seashell-shaped candies. There’s pão de ló de ovar, a decadent, gooey cake. Then there’s lampreia de ovos, perhaps the most unique among the yolk-based offerings. 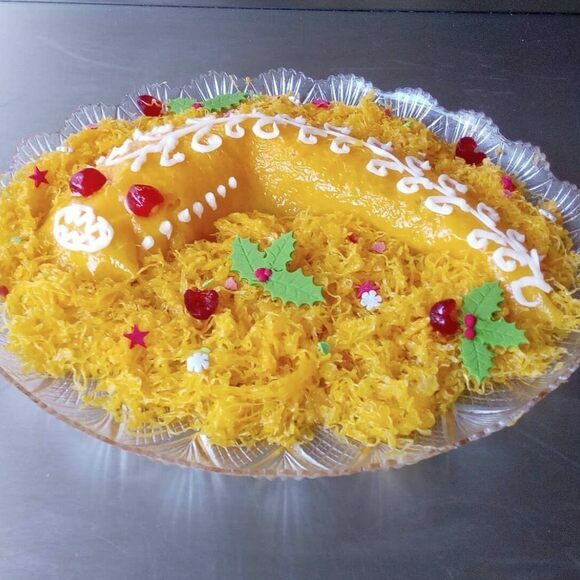 Made from 50 egg yolks, this sweet replica of a terrifying, ancient sea monster also happens to be a Christmas treat in some regions. According to popular lore, nuns made eggs a convent staple after discovering that egg whites kept their habits sharp and wrinkle-free during ironing. After laying claim to Brazil in 1500, Portugal started importing sugarcane as an abundant, inexpensive ingredient. Resourceful nuns looked at all the extra egg yolks and, with the nation’s gold mine of sugar, began creating rich, yellow desserts to support themselves. But why the lamprey, an eel-like, bloodsucking fish with several rows of spiraling, sharpened teeth, of all things? As one travel guide puts it, the Portuguese “so love this ugly river fish they make golden egg effigies of it for festive occasions.” For hundreds of years, the fish served as a suitable red-meat replacement (its texture is comparable to slow-cooked beefsteak) for penny-pinchers and Christians abstaining for Lent. The oldest known Portuguese cookbook, dating back to the 16th century, includes only one fish recipe. It’s for lamprey. A stew made from the fish and its blood is still popular throughout the country. Lampreia de ovos requires no actual parts of the lamprey. All you need to make one is sugar syrup, almonds, and eggs. First, build your lamprey’s winding body from a paste of sweetened yolks and grated almonds, then dress it in sheets of yolks and syrup (“capes”) and strands of beaten egg and sugar. Once you’ve assembled the lamprey’s basic shape, you can brown it in a hot oven or use a red-hot iron to recreate its signature spots. Finally, don’t forget to animate your new friend with a set of candied cherry eyes and a couple of peeled almond teeth. Top it off with sugary egg threads, then glaze and decorate with candy. Delicious, nutritious, and not so horrific after all. Some Portuguese bakeries sell lampreia de ovos, often in beautiful boxes decorated with colored paper, during Christmastime. You can find recipes for making these sweet sea monsters at home, too. This bakery is even named for the lamprey. They're open every day, 6:00 a.m. to 8 p.m. This bakery specializes in traditional Portuguese treats, including lampreia de ovos when it's in season. Sabering champagne doesn’t hold a candle to this method of cracking open wine bottles with red-hot iron. These “holy bones” taste like heaven. Hidden behind a wall, Spanish nuns dole out their signature sweets on a revolving tray.